Our Abpromise guarantee covers the use of ab9698 in the following tested applications. WB Use a concentration of 0.5 - 2 µg/ml. Detects a band of approximately 268 kDa (predicted molecular weight: 196 kDa).Can be blocked with Human AKAP12 peptide (ab23159). Anchoring protein that mediates the subcellular compartmentation of protein kinase A (PKA) and protein kinase C (PKC). Expressed in endothelial cells, cultured fibroblasts and osteosarcoma, but not in platelets, leukocytes, monocytic cell lines or peripherical blood cells. Polybasic regions located between residues 266 and 557 are involved in binding PKC. Cytoplasm > cell cortex. Cytoplasm > cytoskeleton. May be part of the cortical cytoskeleton. Additional bands at: 100 kDa, 30 kDa, 45 kDa. We are unsure as to the identity of these extra bands. AKAP12 contains a number of potential phosphorylation sites (SwissProt data) which may explain it running at a higher molecular weight than predicted. 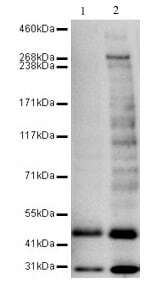 The 268 kDa band is comparable to molecular weights seen with other commercially available antibodies to AKAP12. Publishing research using ab9698? Please let us know so that we can cite the reference in this datasheet. There are currently no Customer reviews or Questions for ab9698.